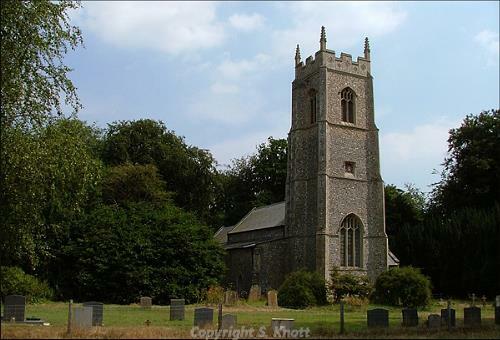 The parish of Westwick is situated in northeast Norfolk, south of North Walsham and west of Worstead. Its name comes from the Old English for ‘West dairy farm’. The parish has a long history, and was certainly well established by the time of the Norman Conquest, its population, land ownership and productive resources being detailed in the Domesday Book of 1086. There are currently only fifteen entries on the archaeological record, but this is probably due to a lack of detailed investigation. For example, there seems to have been little reported metal detecting in the area to date; no doubt further information will come to light in the future. The earliest evidence of human activity comes in the form of two Neolithic flint axeheads, one chipped (NHER 7574) and one polished (NHER 7579), both found in the 1960s. There are currently no Bronze Age finds, but a probable Bronze Age barrow (NHER 7575) is marked on maps of 1838 and 1907 to the north of Arch Farm. Apparently no trace of the barrow can be seen on the ground today, but 1971 aerial photography shows the cropmarks of where it stood. There then follows a yawning gap in the archaeological record, with no current evidence of Iron Age, Roman or Saxon activity. The medieval period has left the parish with its earliest surviving building, St Botolph’s Church (NHER 7585). Lying in the park of Westwick House (see below) and surrounded on three sides by tall trees, this pretty church consists of a tall and ornate west tower, an aisled nave, chancel and south porch, all of which are 15th century. The tower's battlements, finials, west window and bell openings are in the same style, but were added in the 19th century, the whole church being perhaps over-thoroughly restored in 1845. The chancel had its north windows blocked to accommodate a fine series of Burney and Petre monuments, so it is as well that the south priest's door has been replaced with leaded glass, an attractive feature that brightens the east end of the chancel. Other interior items of interest include a splendid carved stone font, painted rood and parclose screens (much restored) and a moulded royal arms of Queen Victoria over the tower screen . The stained glass in the east window shows the Last Supper and is 19th century. A rare occurrence of metal detecting in 2006 netted the only medieval small find, a penny of Edward II (NHER 50470). Most of the remaining entries on the record concern post medieval historic buildings and features. Of the buildings, probably the oldest is Westwick Old Hall (NHER 13087), a 16th century and later two storey thatched red brick manor house, L-shaped in plan and much altered, with single storey outshuts at the rear. To the north of the Hall is an 18th century three stead thatched brick barn (NHER 47220). To the west of the Old Hall is Old Hall Farmhouse (NHER 13086). This was originally an early 17th century timber framed house, one storey high with attics. The building was given a brick façade and a new two storey rear wing in about 1700 and then in the early 19th century the attic storey was raised and re-roofed to form a full upper storey. At the same time the brick façade was heightened and a doorway imitating early 18th century style inserted. Westwick House (NHER 7580) is a big late 18th century three storey rendered brick and flint house, standing on the site of an earlier house, with a slate roof and later additions. The west façade has seven window bays with a central pediment enclosing a coat of arms. The central enclosed porch has Corinthian pilasters. The north wing is 20th century. North of this is a simple stable courtyard, then a walled area in red brick with a stone coat of arms in a niche, certainly older than the current house. North again is a large walled garden with two octagonal summerhouses at corners; parts of this could also be from the older house. The house is set in Westwick Park (NHER 30528), a large historic parkland, probably originally laid out in the 1760s. A crescent-shaped lake was constructed in the 1770s with complicated hydraulic machinery and an aqueduct, though only a tiny segment, Lodge Pond, remains today. The area of the park contracted between 1794 and 1838 but the tree plantations were extended, including the addition of avenues of maritime pine. Westwick Arch (NHER 7581), now demolished, was once the main entrance to the park. Two early 19th century two storey rendered brick and flint lodges remain here, one on each side of the North Walsham to Coltishall road, with pebble rustication to the south and knapped flint to the north. On the south side are central Gothic style arched doorways. On the edge of Westwick Park is Westwick Obelisk (NHER 7582). Built at about the same time as the park was laid out, this is a rendered brick and flint round look-out tower, now barely above tree-level, on a square brick base with flint quoins. The column has rounded openings and is topped by a cast iron platform reached by an internal spiral staircase. Old photographs depict the tower with a gazebo-like structure on top and a documentary source of 1818 describes it as a tea room with a view of the sea. Other post medieval structures have not survived. Two windmills (NHER 13956) are marked on Mill Hill to the west of Captain’s Pond on a map of 1797. No trace of them remains today except the name of their former location. The most historically recent entry is a World War Two crash site (NHER 14442). Details are sketchy, but it is recorded that on the 2 August 1941 a Manchester bomber crashed in Perch Lake. P. Aldridge (NLA), 29 August 2007.